Today I'm sharing some sunny side up cuteness from Unity stamps. I added some "throw away" pieces from other projects along with the chicken wire background I found on the SIL site to make this sweet card. I used some foam tape under the yoke then added a few layers of crystal effects and some clear glitter for salt. 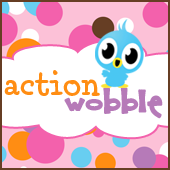 I thought this was a perfect image for an action wobble! Don't ya think?